Ray Barrett, Elizabeth Bell, Robin Chapman et al. Michael Hayes, William Slater, Peter Cregeen et al. 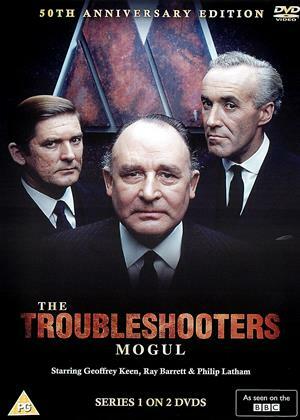 Is the 1960's BBC drama series which portrayed the boardroom battles and frontline dangers of a fictional British oil company, Mogul Oil. The series, one of the BBC's most successful ever, ran for 7 years and attracted a huge audience worldwide. These digitally remastered episodes, including the very first one transmitted, are those that survive from the pioneering first series. Company secrecy is compromised when news of a Mogul oil strike in the North Sea is leaked to the Press. Director of Operations Brian Stead (Geoffrey Keen) wants the culprit sacked and knows that only Head of the North Sea Operations Peter Thornton (Ray Barrett) is tough enough to investigate the breach among the hard men on the rig. Robert Driscoll (Barry Foster) is a marketing man sent to take over negotiations for an important Middle East oil concession...after the local Mogul representative is killed in the desert. Tosh Brinkwater (John Tate) is a hard-living middle aged seaman. When he marries and becomes a father, he decides to change his ways and take a shore job. But when you re a cog in the Mogul machine, good intentions don t always pay off. The desert is like the sea. It takes possession of a man s soul. For a young geologist (Terence Edmond) seeking to prove himself it is exciting. But like the sea, the desert is dangerous. Driscoll is working under highly charged circumstances in northern Canada. When Mogul hires an Iroquois Indian for an important job, deep seated prejudices boil to the surface.